USANA, word! : Are You Ready for USANA Women In Business 2011? Are You Ready for USANA Women In Business 2011? Paula Gosney, Ruby Director, New Zealand, talks with the Dominion Post about her networking marketing business. Paula Gosney is a working mum. She works for herself and teaches others to do the same. She started her USANA business five years ago, and right now she is enjoying her self-employed life, being a mother of two boys. ‘‘I can be at the school gate for my children, I can be the mum who goes on school trips, I can be at everything the boys do and I’m still earning a lot.” Paula says. 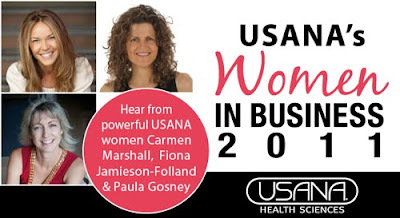 Paula will also be one of the speakers for the upcoming USANA’s Women In Business 2011 event. She is going to share her tips on finding a balance between her career and her family life with her young children. Being an expert in developing a plan, setting goals and knowing how to achieve them, Paula will inspire you to achieve your business goals. The event will also include a networking session where Associates will be able to have that all-important ‘business conversation’ with their guests, show them the different USANA products which will be on display, meet the speakers and chat with other Associates and Corporate staff. Want to find out more about it? Log onto www.USANAtoday.com NOW! Or, call USANA’s Customer Service department on 1800670126 (Australia) and 0-800-370-126 (New Zealand) for more information or to purchase your ticket(s). Whether you are a full-time mum, a student, an office worker, or just looking for an opportunity, this event is for you. After all, running your own business is not about the stages or the situation of your life, it is about having an entrepreneurial mindset. Anyone can achieve higher levels of career success whether male, female, young or old. If you are a male USANA Associate and you think this event has nothing to do with you, think again. You can bring your female prospects and you get the chance to expand your USANA team. Plus we guarantee you will love it too. This event provides an opportunity for almost everyone! We have a group of powerful and successful USANA female speakers who will talk about their personal stories and tips. Speakers include Diamond Director, Carmen Marshall from the United States, 2-Star Diamond Director, Fiona-Jamieson Folland from New Zealand and 3-Star Diamond Director, Mary Ma from Australia. You will connect with their stories and walk away inspired to write your own business story. Watch out for our upcoming blogs in which you’ll get to hear more about these inspiring women.